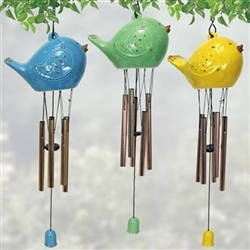 These adorable, whimsical bird chimes will add color and interest to your garden. Made of hand glazed porcelain and metal, they measure a total of 26" long (specifications: 6.75"x4"x4.5"). Select from 3 colors - or, at these prices, why not choose 1 of each?